Techstars Startup Week Fort Collins is right around the corner and with multiple venues on the docket we don’t want parking and transportation to be a challenge. Check out this quick list of where to park (and where not to park) when traveling between locations. We also have information about public transportation and Fort Collins Bike Share for those who want to avoid driving and parking altogether. A biodiesel shuttle will run between venues. Thanks Biodiesel For Bands! Look for shuttle signage and information on site during the week and check out the shuttle schedule now. There are many options when looking for parking in Old Town. The City of Fort Collins has two parking structures available for hourly parking and five surface lots with free 2 hour parking. First hour is free in the parking garages, and then it is $1 per hour after. Free street parking is limited to two hours, so pay attention to signage to avoid a visit from parking enforcement. If you use street parking in the Old Town area for more than two hours, please be sure to move your vehicle farther than a few spaces away – its best to move your vehicle to another street to avoid ticketing. 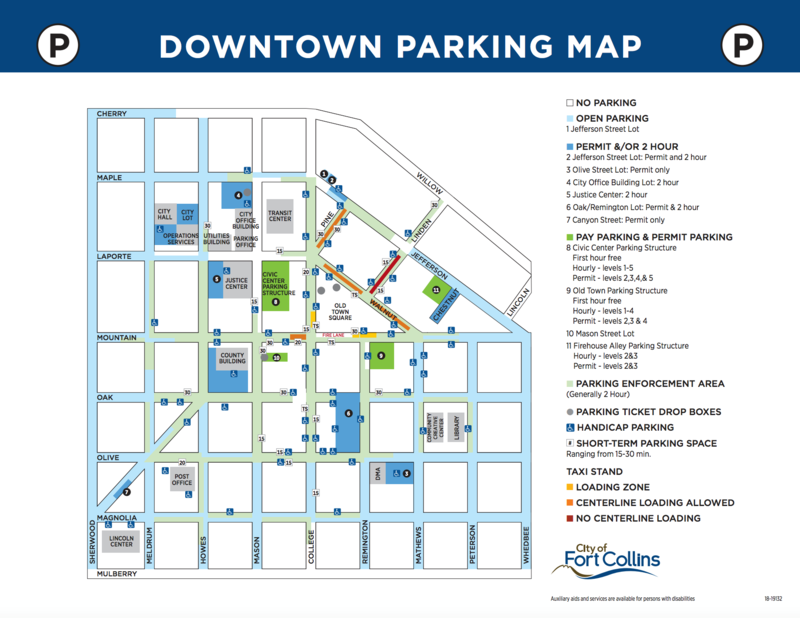 For an Old Town parking map with detailed information visit the City of Fort Collins Structures and Surface Lots webpage. There are two parking lots at Innosphere, one outside the main entrance and an overflow lot located just east of the building. There is free 2 hour parking on the streets surrounding The Music District in addition to limited parking in the lot just west of the main building. To access this parking lot, drive South on College to Myrtle and turn West, then turn South into the first alley on your left. The parking lot will be on your left. All other venues located outside of the Old Town area will have dedicated parking lots for your convenience. Taking Transfort and MAX may also be an option for you. The Downtown area is serviced by several MAX stops. Transit passes can be used on any Transfort bus service and Conference Passes can be purchased at a discount.